Good confronts evil in Wave 3 of Cartoon Network Titans. Characters from Adventure Time, The Powerpuff Girls, We Bare Bears, and more! There are hidden chase figures for you to hunt and collect! Ages 15 and up. These 3-inch tall mini-figures include character-specific accessories. Display case contains 18 randomly selected, blind-packaged mini-figures. 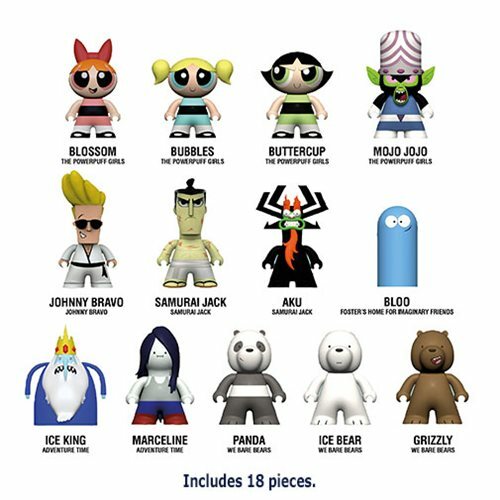 Treat yourself to the Cartoon Network The Townsville Titans Collection! Each marvelous mini-figure measures approximately 3-inches tall, includes character-specific accessories, and comes blind boxed. There are even hidden chase figures for you to hunt and collect! Iconic supervillains Aku and Mojo Jojo face off against the noble warrior-prince Samurai Jack, smooth-talking black belt Johnny Bravo, and Townsville's favorite trio of superhuman crime-fighters - Bubbles, Blossom, and Buttercup - the Powerpuff Girls! Also, hailing from the Land of Ooo, Adventure Time's otherworldly Ice King and Marceline are joined by the We Bare Bears. Collect them all!